The southern province of Andalucia, particularly the area around the Costa del Sol, is the epitome of good-value, romantic Spanish living. 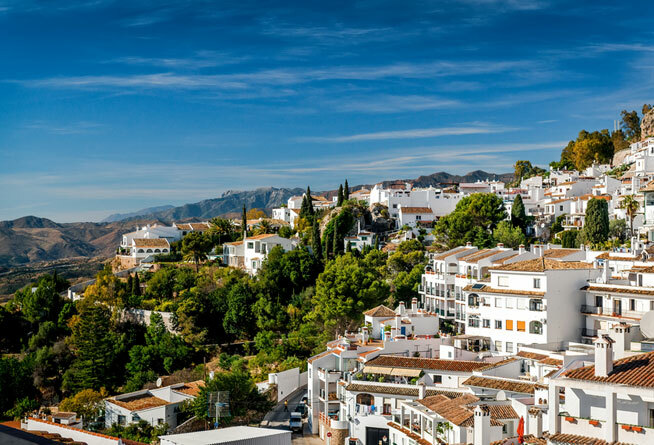 It has everything: long, sandy beaches perfect for strolling on…romantic, white-washed hill towns cling to the Andalusian hillsides…a sunny climate where snow and even rain are a rarity…and a cost of living so affordable you’ll find it hard to believe you’re in a European country. You’ll share a three-course meal with a friend for as little as $40, rent from $760 a month… All told, a couple can live comfortably on $3,000 a month—and that includes the cost of exploring all the country has to offer. Southern Spain is most famous for its beaches and resort towns. If you’re a beach lover, you’ll find plenty of options for beachside living. Marbella is the glitzy heart of this stretch of coastline, attracting tourists and the wealthy jet-set from around the world. It has restaurants offering international cuisine, lots of boutique clothing stores and a pretty Old Town that’s a pleasure to ramble through. Despite its glamorous reputation, Marbella is still affordable. You can buy two-bedroom apartments, about a 10-minute walk from the beach, from $200,000. Just a 10-minute drive from Marbella you’ll find San Pedro, a quieter, more authentic, Spanish beach town. Popular with Spanish holidaymakers, San Pedro has yet to draw the attention of the tourist hordes…and they’re missing out. The long beachside promenade is a palm-tree lined avenue and the perfect place to soak up some of the Mediterranean sun. Here, you can rent a two-bedroom apartment, a short walk to the beach and the town centre for around $1,000 a month. Although I love the beaches of the Costa del Sol, it’s the area’s mountain towns that really charm me. Just a short drive from the coast, hidden among the green hills, are some of Spain’s most enchanting and affordable towns. My favourite was Mijas. This “white town” (pueblo blanco) sits on a hilltop 20 minutes from Malaga. Founded in the second century, it has held onto its traditional Andalusian atmosphere: narrow cobblestone streets, crammed on either side by whitewashed stone buildings. Many are boutiques, local artisan jewellery stores and expat-owned chocolate shops. The cherry on top of this cake is the cost of renting. A two-bedroom apartment with a shared swimming pool can be yours for $860 a month. Another of this area’s mountain towns that stole my heart is the peaceful pueblo of Torrox. It’s the kind of place where time stands still. The quaint village square, Plaza de la Constitucion, is lined with orange trees, their faint scent filling the air. Here locals sit in cafes or on one of the many wooden benches to watch the world go by. The town hall stands proudly at the end of the square, its green shutters a colourful contrast to its brilliant white walls. Life in Torrox is easy and serene. The price of a new home in Torrox will also be easy on your wallet. Currently a two-bedroom townhouse, in a pretty plaza, is on offer for just $86,000. A cosy one-bedroom apartment just 100 metres from the beach can be rented on a long-term basis for $515 a month. As I’ve mentioned, accommodation isn’t the only thing in southern Spain that’s good value. The food, in particular, is great value. My favourite dining experience was a three-course meal of crispy deep-fried Camembert, a Mediterranean fish bisque, followed by warm chocolate cake smothered in cream for just $22. The perfect end to a serene day in southern Spain.